Maintaining some of the best reviews for our online accounting subscription sources is a top priority for CPEThink. Created by and for Certified Public Accountants and IRS Enrolled Agents, we understand what you need from your CPE Subscriptions and exactly how you want the CPE courses delivered. With any time, instant customer service, we take an all-hands-on-deck approach to further your education without having to spend hours in a classroom. Enhance your skills, further your education, and maintaining your licensing requirements with our hundreds of industry-leading, self-paced online CPE courses. We offer the most competitive prices with impeccable value. All of your resources and tools will be available online in one place. Offering CPE Subscriptions for online CPE courses that cover all of your licensing requirements, you’ll maintain the flexibility to join courses regardless of where you are in your licensing journey. Start, continue, and complete your CPA requirements with our industry-leading accounting CPE and IRS EA course subscriptions. Part of CPEThink’s mission is to help you stay ahead. The most effective way we do this is by offering you bundled courses. This format ensures you get the most competitive price for only the CPE subscriptions you need when you need them. CPE subscriptions help you maintain and stay up-to-date with your credit and licensing requirements. It also serves as a way to make sure you’re always on top of your education so that you are capable and ready to offer your services with a competitive edge. We have a variety of subscription offers to choose from so that you have everything you want and nothing you don’t need. Here’s a brief description for you to choose which accounting CPE course subscription is suitable for you. For more information Review CPE Subscriptions Here. Unlimited Access To All Courses - All Ethics On Our Site Included - Unlimited Final Exams For a period of 1 full year (12 months + 1 Day) from the date of purchase you have unlimited access to everything on our site. Unlimited Final Exams For a period of 2 full years (24 months + 1 Day) from the date of purchase you have unlimited access to everything on our site. For a period of 1 full year (12 months + 1 Day) from the date of purchase, you have access to everything on our site and be able to add up to 45 CPE credit hours to your account. Subscription upgrades allowed, additional individual credits $9 per credit hour. For a period of 1 full year (12 months + 1 Day) from the date of purchase, you have access to everything on our site and be able to add up to 30 CPE credit hours to your account. Subscription upgrades allowed, additional individual credits $9 per credit hour. Please note: If you need 40 or more hours in a 12 month period please consider one of our other subscription options. An astonishing 50-60 percent of random audits conducted by the State’s Board of Accountancy didn’t pass the committee inspection. We refuse to let that be you. Begin your CPE subscription today. Once you’ve selected the CPE subscription fit for your needs and timeline you can begin right away, or tomorrow, or next month. These courses are self-study so that you can complete your requirements as early as you’d like. Remember, you have unlimited attempts to finish with your best final exam score. You will have access to your courses for up to a year to two years with the occasional course reminder. We know you’re busy, that’s why CPE accounting course subscription was made easy. Subscribe, test, pass and continue to flourish in your career with no more roadblocks. 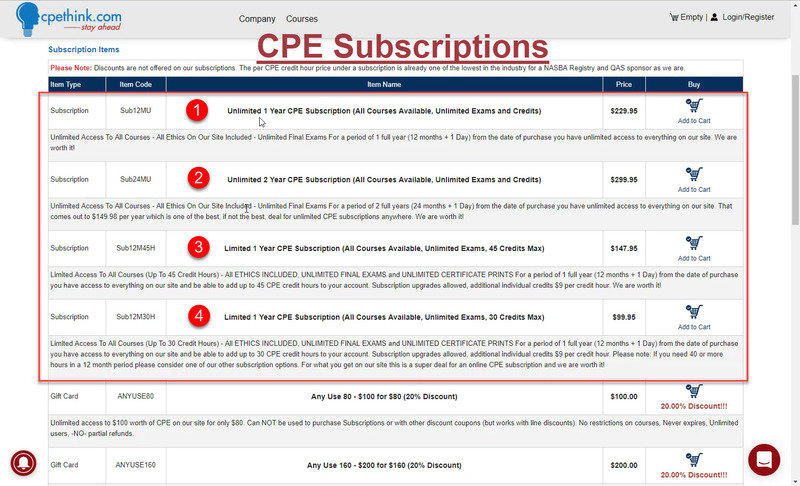 CPE Subscriptions are the way many CPAs and IRS EAs are going to get their online CPE courses. Accessible 24/7/365 anywhere on the Internet gives them maximum flexibility and eas of use with the least amount of downtime and risk. See what other satisfied CPAs and EAs are saying that have used Cpethink.com at https://www.cpethink.com/cpe-reviews. Only after customers have purchased and completed a course on Cpethink.com are they asked for to leave a review..